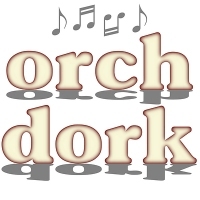 This “Orch Dork” design is for all those music geek type Orchestra members who proudly wear their dorkiness on their sleeve. Now you can wear it on your chest, if you prefer, or display it in your home, office, or on your vehicle! Find the perfect gift for your favorite Orchestra dork – maybe that’s you! Whether on a shirt or other apparel, mug, bag, or whatever, you’ll find it here!